If you enjoy the great outdoors, then Bushwalking is one of the best ways to experience and appreciate what nature has to offer. 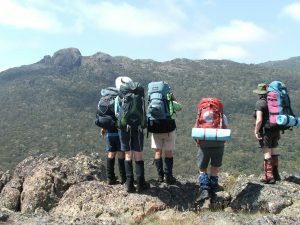 Bushwalking offers numerous benefits, including physical challenges, skills development and the opportunity to meet new people. 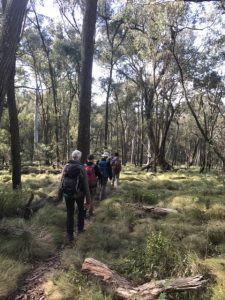 We offer a full program of bushwalking activities throughout the year, ranging from our local easy evening walks, to longer backpacking trips, with many options in between. The club suits all levels of bushwalking and hiking experience. Activities are graded according to difficulty and are led by committed and experienced volunteer leaders. Easy – are amongst our most popular walks and can range from an after work stroll to a full day in the mountains. Medium – generally longer and may involve travelling up to 1 – 2 hours into the surrounding areas and Alps. Hard – for those seeing adventure and who are physically fit enough to meet the challenge; often required to cover longer and/or more difficult routes and terrain. 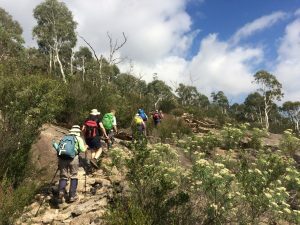 These walks allow participants to enjoy all that a day walk offers, plus the ability to venture further and camp overnight, experiencing a night(s) in the bush. It involves carrying all your gear (tent, bedding, stoves, food and essential clothing) in a larger and heavier backpack. As for Overnighters, but these walks range from several days to weeks allowing participants to travel in to and experience remote natural environments for longer periods. Packs will be a lot heavier. It is strongly recommended that all participants have ambulance cover for their own wellbeing. Walk Leaders reserve the right to change the walk route on the day depending on prevailing conditions and altered circumstances. Members and visitors must check with the Leader that their fitness and experience suit the walk. A Leader can refuse permission for any person to take part in his/her activity. A reminder that if you intend participating in any of the day activities listed in the Activities Program, you are generally required to book in with the Leader by Wednesday, and for overnight walks at least 7 days prior to the trip. If you haven’t walked with a Leader before, you must call them personally to book in for an activity (not email or sms). This is so the Leader can get an idea of your suitability for the activity – that is, your health/fitness and that you have an appropriate level of experience for that activity. They will also be able to advise you of any key risks, or gear requirements. Our Leaders don’t want to grill you, but we need to ensure everyone is able to safely participate without putting you or others at risk.